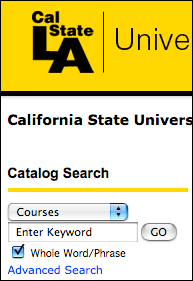 To access the Cal State University, Los Angeles’ online catalog, click on a catalog year that you would like to view (e.g. 2009-2010 Undergraduate Catalog) from any catalog page. To switch between the different catalogs, use the drop down menu at the top of the page and choose from the available catalogs. At all times, a navigation menu is available on the left side of the page. Use the menu to navigate through the different sections of the catalog. Use the catalog search box to key in what you are seeking information about. Click on an item in the navigation menu. 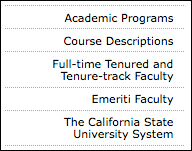 To find information on a department or its programs (majors, minors, and certificates), click on “Programs” on the left menu. Programs are listed under their departments. To find a specific program, scroll to find the appropriate department. My Portfolio allows users to browse through the online catalog to save programs and courses of interest. Users can save content from any catalog in one portfolio. Simply click on the “Add to portfolio” link located above the program/course description or below the entire document to save for future use. You may review items in your portfolio at any time by clicking on the “My Portfolio” link. “My Porfolio” is cookie based, therefore when you have cleared cookies from the browser cache, items in your portfolio will be cleared.